On a trip to the United Kingdom, our family visited a castle. In the center of the garden sat a maze. Row after row of shoulder-high hedges, leading to one dead end after another. 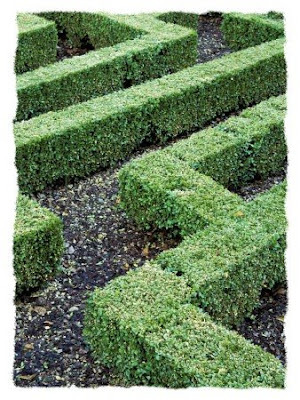 Successfully navigate the labyrinth, and discover the door to a tall tower in the center of the garden. Were you to look at our family pictures of the trip, you'd see four of our five family members standing at the top of the tower. Hmmm, someone is still on the ground. Guess who? I was stuck in the foliage. I just couldn't figure out which way to go. Do you think I trusted her? I didn't have to. But do you know what I did? I listened. Her vantage point was better than mine. She was above the maze. She could see what I couldn't. Don't you think we should do the same with God? Ah, this was a perfect lesson. Yes, we should do the same with God. We just have to trust and let go. Yes, we certainly should, Adrienne. Hope you are having a wonderful vacation. Come on over to my blog. I tagged you for a fun game. So very true! We need to let go and follow Gods lead in our lives. Thank you for this reminder!